The purpose of this study was to assess differences in breast cancer-specific mortality within tumors of the same size when breast cancer was defined using the three tumor markers estrogen receptor (ER), progesterone receptor (PR), and human epidermal growth factor receptor 2 (HER2). We identified 104,499 cases of node-negative primary female invasive breast cancer from the California Cancer Registry. Tumor size was categorized as T1a, T1b, T1c, T2, and T3. Breast cancer was defined using ER, PR, and HER2. 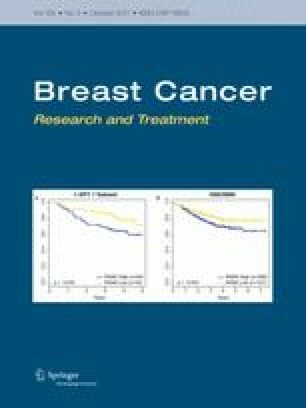 Kaplan–Meier Survival analysis was conducted and Cox Regression was used to compute the adjusted risk of mortality for the ER+/PR+/HER2+, ER−/PR−/HER2− (TNBC), and ER−/PR−/HER2+ (HER2-overexpressing) subtypes when compared with the ER+/PR+/HER2−. Separate models were computed for each tumor size. Unadjusted survival analysis showed that for all tumor sizes, the ER+/PR+ subtypes regardless of HER status have better breast cancer-specific survival than ER−/PR− subtypes. Subtype was not an important factor for risk of mortality for T1a tumors. The ER+/PR+/HER2+ subtype was only a risk for mortality in T1b tumors that were unadjusted for treatment. For all other tumor sizes, the ER+/PR+/HER2+ had the same mortality as the ER+/PR+/HER2− subtype regardless of adjustment for treatment. The HER2-overexpressing subtype had a higher risk of mortality than the ER+/PR+/HER2− subtype except for T1b tumors that were adjusted for treatment. For all tumor sizes, the TNBC had higher hazard ratios than all other subtypes. T1a tumors have the same risk of mortality regardless of ER/PR/HER2 subtype, and ER and PR negativity plays a stronger role in survival than HER2 positivity for tumors of all size. We wish to thank Melissa Taylor and the staff at the Sutter Resource Library for their valuable assistance. This study was funded by Grant 947110-1107555 from the Sutter Medical Center Sacramento Foundation.